Capital of Egypt and one of the most prominent cities of the Islamic world. The English name for the city derives from the French, Le Caire, which in turn is derived from the Arabic al-Qahira. The modern town is composed of the remains of four cities established in this area during the early Islamic period. At the time of the Islamic conquest the capital of Egypt was Alexandria, although by 641 a new city called Fustat was founded further south on the east bank of the Nile, next to the old Roman fortress town of Babylon. In 750 the newly established Abbasid caliphs established another city or camp known as al-‘Askar to the east of Fustat. During the ninth century the semi-autonomous Tulunids expanded further north-east with the establishment of the city of al-Qataic which was based around the grand palace of Ibn Tulun. Under the Fatimids Egypt became the seat of the caliphate and to this end in 971 a new city was founded to the north-east. Originally the city was called al-Mansuriyya, but four years later was renamed al-Qahira ‘the victorious’, after al-Qahir (the planet Mars), which was in the ascendant at the time of its foundation. Although today the whole city is referred to officially as Cairo or al-Qahira, before the eighteenth century only the original Fatimid capital was referred to by this name whilst the whole city was known as Misr or Masr (literally Egypt). The original al-Qahira of the Fatimids was a luxurious palace city described by contemporary writers as having marble floors grouted with gold and vast treasure houses filled with beautiful golden objects. From the tenth to the twelfth century Cairo was symbolically divided between al-Fustat, the commercial and popular capital, and al-Qahira, the royal city of the caliphs. The devastation and dislocation brought about in Egypt by the Crusaders changed the old order, so that al-Qahira was no longer exclusively a royal enclosure and instead became the true capital whilst al-Fustat became a dying suburb. Salah al-Din planned to unite the city by enclosing both Fustat and al-Qahira in massive walls. Although unable to complete this project Salah al-Din was able to build the massive citadel on Muqattam hill. During the Mamluk and Ottoman periods the city continued to grow with suburbs growing up around the citadel and al- Qahira and huge cemeteries extending east and west into the desert. The two most important pre-Fatimid buildings to survive in some form are the mosque of Camr at Fustat and the mosque of Ibn Tulun. Little survives of either, nor of the original mosque of Camr ibn al- ‘As built in 641 and said to be the earliest mosque in Egypt. The most important feature of the present mosque is that it indicates the position of the original settlement of al-Fustat. The mosque of Ibn Tulun on the other hand represents the remains of the city or settlement known as al-Qataic founded by Ahmad ibn Tulun. In many ways the Tulunid capital resembled the contemporary Abbasid capital at Samarra—from the triple-arched gate, the polo ground and the racecourses, to the extensive use of stucco. This is earliest time from which a significant number of monuments survive. It was during this period that Egypt became centre of the caliphate which ruled from North Africa to Palestine. Although the Fatimids ruled a vast empire, they were to a certain extent strangers in Egypt as the majority of the population remained Sunni. This alienation is reflected in the way al-Qahira was kept as an official city closed to the general population. The caliphs lived in palaces lavishly decorated with gold and jewels and when they died they were also buried within them. Unfortunately nothing survives of these palaces as they were systematically destroyed by later rulers, although detailed descriptions can be found in the writings of Nasiri Khusraw or al- Maqrizi. 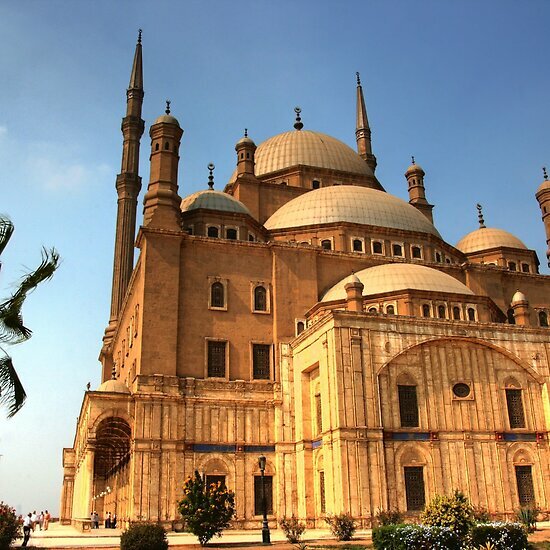 The best surviving examples of Fatimid architecture in Cairo are the mosques of al-Azhar (970) and al-Aqmar (1125) which demonstrate a transition from early Islamic to medieval forms. Despite later accretions, the mosque of al-Azhar represents an early Islamic hypostyle form with three arcades around a central courtyard. The sanctuary is composed of five aisles parallel to the qibla and a central transverse aisle which is emphasized by being both higher and wider than the surrounding roof. Originally there were three domes at the qibla end, one in front of the mihrab and one on either side. Three aisles around a central courtyard and the arrangement of three domes are all features common in early North African mosques. Inside the mosque was lavishly decorated with stucco work, only part of which survives (around the mihrab and on parts of the arcades). The stucco has some Abbasid influence although there are also Byzantine and Coptic elements in the designs. Built some 150 years later, the mosque of al- Aqmar has a much more sophisticated design, reminiscent of the later medieval buildings of Cairo. It was founded by the vizier Ma’mun al Bata’ihi during the reign of Caliph al-Amir. The interior plan consists of a small central courtyard surrounded on four sides by triple arcades. The sanctuary consists of a small area divided into three aisles parallel to the qibla wall. Initially the mosque would have been covered with a flat hypostyle roof but it is now covered with shallow brick domes. Stylistically the most important feature of the plan is the way the entrance is positioned at an angle to the main building. This feature allows the mosque to be incorporated into a pre-existing street plan whilst having the prayer hall correctly aligned for the qibla. This is one of the earliest examples of this type of plan which was to become more pronounced in Mamluk religious buildings. The other important feature of the al-Aqmar Mosque is the decoration of the facade which was developed in later mosques to be a main feature of the design. The facade is made of stone overlying a brick structure. Today the right hand side is hidden by a later building but it is assumed that it was originally symmetrical with a projecting portal in the middle. The decoration of the facade is dominated by decorated niches with fluted conch-like niches, an arrangement used in more complex forms in later mosques. The al-Aqmar Mosque is also significant as the earliest mosque to incorporate shops in its design (these were below the present street level and have been revealed by excavations). Another important mosque of Fatimid Cairo is that of the caliph al-Hakim built between 990 and 1003. The mosque, which has recently been restored, has a large rectangular courtyard surrounded by four arcades. A transept aisle opposite the mihrab indicates the direction of the qibla which is further emphasized by three domes. The entrance to the mosque is via a large projecting portal similar to that of the mosque of Mahdiyya, the Fatimid capital in North Africa. Probably the most famous feature of this mosque are the minarets at either end of the north facade. They were built in 990 and consist of one octagonal and one cylindrical decorated brick tower; at some later date (probably 1110) the lower parts of these minarets were encased in large brick cubes for some unknown reason. Apart from mosques, various other types of religious building are known to have been built in Fatimid Cairo including many tombs or mashads devoted to religious personalities. However, most of these have not survived or have been altered beyond recognition as they have been in continuous religious use. An exception to this is the mashad of al-Juyushi also known as Mashad Badr al-Jamali. This structure consists of two main parts, a domed prayer hall opening on to a courtyard and a large minaret. Although there is a side chamber which may have been a tomb, there is no positive identification of the person commemorated. The prayer hall is covered with cross vaults except for the area in front of the mihrab which is covered with a tall dome resting on plain squinches. The minaret is a tall square tower capped by an octagonal lantern covered with a dome. A notable feature of the minaret is the use of a muqarnas cornice which is the first example of this decoration on the exterior of a building. The roof of the complex also houses two small kiosks whose function has not been resolved. Other notable Fatimid mashads are the tombs of Sayyida Ruqayya and Yayha al-Shabih both in the cemetery of Fustat. The first of these was built to commemorate Sayyida Ruqayya, a descendant of Cali even though she never visited Egypt. The layout of this building is similar to that of al-Juyushi except that the dome is larger and is fluted inside and out. Visually the most impressive feature of this building is the mihrab, the hood of which is composed of radiating flutes of stucco set within a large decorated frame. The best surviving examples of Fatimid secular architecture are the walls and gates built by Badr al-Jamali between 1087 and 1092. The first walls and gates of Cairo were built of brick during the reign of al-Mucizz but were replaced with stone walls by Badr al-Jamali in the eleventh century. The stone for the walls was mostly quarried from ancient Egyptian structures and many of the stones display hieroglyphic inscriptions and ancient motifs. The walls were built on three levels: a lower level raised slightly above the street level containing shops and the entrances to gates, a middle level containing vaulted galleries and pierced with arrow slits, and an upper level consisting of a parapet protected by large rounded crenellations. The gates are set between large semi-circu-lar or rectangular buttress towers, the lower parts of which are made of solid masonry. The surviving gates of Fatimid Cairo are Bab al-Nasr (Gate of Victory), Bab al-Futuh (Gate of Conquest) and Bab Zuwayla (after a North African tribe prominent in the Fatimid armies). The general appearance of the towers and gates seems to be developed from Byzantine military architecture. The Ayyubid period in Cairo represents a return to orthodox Sunni Islam. One of the consequences of this was that there was not allowed to be more than one Friday mosque in any urban area. Instead the Ayyubid period saw the foundation of many madrassas and khanqas as a means of propagating orthodox law and religion. The earliest such madrassa was that of Imam Shafci founded by Salah al-Din. Although the madrassa has not survived, the connected tomb of Imam Shafci still stands. This is much larger than any of the earlier Fatimid tombs measuring approximately 15 m square underneath the central dome. The wooden cenotaph of the imam survives intact and is decorated with carved geometric designs around bands of Kufic and Naskhi script which are dated to 1178. The best surviving example of an Ayyubid madrassa is that of Sultan al-Salih Najm al-Din Ayyub built in 1243. It is built on the site of one of the great Fatimid palaces. Like the Mustansari-yya this madrassa was built for all four of the orthodox Sunni rites of Islamic law with a separate area for each rite; today only the minaret, the entrance complex and part of the east courtyard survive. The original plan consisted of two courtyards either side of a passageway. Each courtyard was flanked on two sides by small barrel-vaulted cells and on the other two sides by large iwans. The minaret of this complex is the only surviving Ayyubid minaret of Cairo and consists of a square brick shaft with an octagonal upper part covered with a ribbed dome. The entrance-way includes a decorated keel-arched niche, in the centre of which is a Naskhi foundation inscription; the whole is encased by a muqarnas frame. One of the finest buildings attributed to the Ayyubid period is known as the ‘Mausoleum of the Abbasid Caliphs’ because it was used for this purpose after the Mongol sack of Baghdad. Al-though there is some dispute about its date of construction, it is generally agreed to have been built between 1240 and 1270. The central dome is supported on two tiers of squinches which alternate with similarly shaped windows and muqarnas stucco niches so that the zone of transition becomes two continuous bands of niches. This pattern was later adopted for most domes resting on squinches. Other important buildings of the late Ayyubid period are the tomb of Sultan Salah al-Din, the mausoleum of Shajarat al Durr and the minaret of Zawiyat al Hunud all dated to around 1250. Few remains of secular buildings survive with the exception of the citadel and the fortification walls. The citadel was probably the most substantial building of Ayyubid Cairo, its main function being to strengthen and connect the city’s walls. It was built on Muqattam hill in the style of Syrian castles of the Crusader period using material taken from several small pyramids at Giza which were demolished for the purpose. Both square and round towers were used to fortify the walls which may reflect two periods of construction, one under Salah al-Din and one under his son and successor al-Malik al-Adil. Innovations to the fortifications included bent entrances in the gateways and arrowslits which reached the floor. The early Mamluk period is architecturally the most prolific period in Cairo with a wide range of major building projects carried out. Many of these buildings have survived demonstrating a diverse range of styles, techniques and designs. During this period some of the major forms of later Cairene architecture were established such as the erection of sabils on street corners often linked to primary schools. During this period there was also considerable foreign influence from Sicily, Iran, North Africa and Spain which was absorbed into the architecture of Cairo. Congregational mosques were founded during this period after the strict Shafi’ite orthodoxy of the Ayyubid sultans who only permitted one congregational mosque in the city, that of al-Hakim. Under the Mamluks each area had its own Friday mosque and during the fourteenth century madrassas and khanqas were also used as Friday mosques. The earliest and grandest mosque built under the Mamluks was that of Sultan al-Zahir Baybars built between 1266 and 1269. Although partially ruined the general plan of this mosque can be reconstructed—it consists of a large rectangular courtyard with arcades on four sides and projecting entrances on three sides. Most of the arcades rested on columns except for those around the sanctuary which rest on rectangular piers. The outer walls are protected by rectangular buttresses in between which are pointed arched windows with stucco grilles. The walls are built out of stone, and alternate courses are painted to achieve the effect of ablaq masonry; the upper part of the wall is crenellated. There was once a minaret next to the main entrance which has now disappeared. The area in front of the mihrab known as the maqsura was once covered with a large wooden dome decorated in marble; between this and the courtyard was a nine-domed transept. Another royal mosque of this period is that of Sultan al-Nasir Muhammad at the citadel, built between 1318 and 1385. Like that of Baybars this is a hypostyle mosque built around a rectangular courtyard with a large dome covering the area in front of the mihrab. The most remarkable feature of this mosque are the two cylindrical stone minarets, one opposite the army headquarters and the other opposite the royal palace. The more elaborate of the two faces the palace and is decorated with vertical and horizontal zig-zag patterns with a small solid bulbous dome on the top. The other minaret is similar except that it is less decorated and has a hexagonal pavilion covered by a bulbous dome. The upper portion of each minaret is covered in blue, white and green faience tiles. It seems likely that both the faience decoration and the bulbous domes are copied from similar minarets in Iran, probably Tabriz, where such forms were common at the time. Other important mosques built during this period were those of Amir Altinbugha al-Maridani built in 1340 and of Amir Aqsunqur built in 1347. Important features of the al-Maridani Mosque include the minaret which is the earliest example of the octagonal minaret with pavilion which was to become typical of later Cairene architecture. The building is also notable for its wooden mashrabiyya screen that separates the maqsura from the rest of the mosque. The mosque of Aqsunqur is a good example of an attempt to use a Syrian building tradition in Egypt. The building was originally roofed with cross-vaults in the Syrian style but later these were replaced with a flat wooden roof. Probably the most famous building of Mamluk Cairo is the Sultan Hasan Mosque. This was built on a four-iwan plan madrassa and was the first madrassa in Cairo to be accorded the status of a congregational mosque. The building consists of a square central courtyard with four great iwans. The largest of the iwans is a prayer hall behind which is the domed mausoleum. Between the four iwans are four separate courtyards one for each of the orthodox Sunni rites of Islamic law. The building includes several notable architectural features amongst which are the doorway thought to be modelled on that of the Gok Madrassa at Sivas and the floriated stucco inscriptions in the prayer hall. Mausoleums were a common feature of religious and semi-religious institutions from the early Mamluk period onwards. One of the best examples of this is the mausoleum, madrassa and hospital of Sultan al-Mansur Qalawun built between 1284 and 1285. Today the hospital has disappeared leaving only the madrassa and mausoleum. The madrassa is built on the typical Cairene four-iwan plan with iwans of differing sizes. The largest iwan is that of the prayer hall which is arranged in three aisles like a Byzantine basilica. The most outstanding feature of the complex is the mausoleum itself which consists of a huge rectangular hall with a central dome supported on piers and massive columns arranged in a manner similar to the Dome of the Rock in Jerusalem. The walls are decorated in a wide variety of materials including marble inlay, mother of pearl and coloured stones. The mihrab is one of the largest in Cairo and is decorated with several tiers of blind niches within the niche itself. The importance of the mausoleum is evident from the fact that it had its own madrassa in addition to the madrassa attached. Although mausoleums did not usually achieve the grandeur of Qalawun’s tomb, often the mausoleum was the most impressive part of a complex. Thus the tomb of Sultan Baybars al- Jashankir was an elaborate and richly decorated building in relation to the rather plain khanqa associated with it. Tombs often acted as a focal point for a building and sometimes incorporated foreign features or unusual techniques in order to draw attention to the building and its founder. This can be seen in the madrassa-mausoleum of Amir Sarghitmish built in 1356 where the mausoleum is not placed next to the prayer hall as was usual but instead was built in a position so that its facade and profile were directly on the main street. The mausoleum is covered by a double-shell dome set on an unusually high drum with an exterior moulding of muqarnas marking the transition from drum to dome. This form of dome is not usual in Cairo and may have been copied from similar domes in Samarkand. Several developments took place in the fifteenth- century architecture of Cairo which distinguish it from the earlier Mamluk period. These developments were of two basic types: those concerned with the layout and plan of buildings and those concerned with the decoration and construction of buildings. The biggest factor affecting design and layout was the lack of space in an increasingly crowded area. The most obvious result of this was that mosques tended to be smaller and were designed to fill awkwardly shaped plots. The size of mosques was reduced in a number of ways, the most notable of which was the reduction in size of the central courtyard until it became a small square area in the centre covered by a wooden lantern to admit light. A result of this design change was that the side walls of mosques were now pierced with many windows to make up for the lack of light from the courtyards. Also there was a move away from the hypostyle mosque towards the four-iwan plan used for madrassas. However, the form of the iwans changed from brick or stone vaults to flat wooden roofed units. Another change was that now madrassas did not include accommodation blocks for students who were located outside. The trend which had begun in the fourteenth century of using madrassas as Friday mosques was extended so that now buildings would fulfil several roles such as khanqa, madrassa and jami. The earliest example of such a combination was the complex of Sultan Barquq built between 1384 and 1386. One of the exceptions to the decreasing size of mosques is the Khanqah of Sultan Faraj ibn Barquq built between 1400 and 1411. This large complex was deliberately built outside the main urban area in the cemetery on the eastern outskirts of Cairo. The plan adopted for this building was that of a hypostyle mosque, with a spacious central courtyard containing an octagonal central fountain. Despite its traditional Friday mosque layout this structure contained living units for Sufis as well as two domed mausoleums flanking the sanctuary or prayer hall. Many of the changes in the architecture of the late Mamluk period are concerned with the building and decoration of domes. Among the most famous features of Cairo are the carved stone domes built during this period. These are fairly unique to Cairo although occasional examples can be found elsewhere, such as the Sabil Qaytbay in Jerusalem which is known to be a copy of similar Egyptian domes. Up to the late fourteenth century most domes in Egypt were either built of wood or brick, and stone domes were only used for the tops of minarets. It is thought likely that this was the origin of the larger stone domes used on tombs. The earliest stone domes had ribbed decoration similar to that seen on the tops of minarets; later this was developed into a swirled turban style as can be seen on the mausoleum of Amir Aytimish al-Bajasi built in 1383. The next stage was zig-zag patterns followed by the intricate star patterns which can be seen on the mausoleums built for Sultan Barbays. Under Sultan Qaytbay an important innovation was made where the star pattern would start at the top, whereas previously decoration had started at the bottom. With the increasing sophistication of dome decoration it was natural that domes were set on higher drums so that they could be seen from far away. The increased confidence in stone carving exhibited in domes is also reflected in the decoration of minarets which are now also carved in stone. One of the earliest examples of this is the minaret belonging to the complex of Sultan Barquq built between 1384 and 1386. The minaret is octagonal throughout and has a central section composed of giant intersecting circles. Another innovation in the architecture of this period was the triangular pendentive. The earliest examples in Cairo were used in the citadel mosque of al-Nasir Muhammad and were made of wood. Later pendentives were used for stone domes although muqarnas squinches continued to be used. A related feature introduced at this time was the groin vault used in complex arrangements for portals. Often doorways would be covered by a complex groin vault with a small dome in the centre forming a half-star shape. The Ottoman conquest of Egypt marks a fundamental change in the architecture of Cairo. Most notice-ably, new architectural forms were introduced from Istanbul and Anatolia, whilst several types of Mamluk buildings, such as domed mausoleums or khanqahs ceased to be built. One of the earliest Ottoman buildings of Cairo is the mosque of Sulayman Pasha built in 1528. This building is almost entirely Ottoman in its construction and shows little relationship to the preexisting Mamluk architecture. The mosque consists of a central prayer hall flanked by three semi-domes and opening on to a central courtyard enclosed by domed arcades. In addition to new layouts and forms the Ottomans also introduced new types of buildings such as the takiyya which performed a similar function to the khanqa and madrassa. Unlike the khanqa or madrassa the takiyya was built separate from the mosque. This was characteristic of Ottoman institutions which were built separately from mosques rather than as buildings with several functions like the madrassa, khanqa, jami combination of the late Mamluk period. Despite the new styles and forms introduced by the Ottomans many buildings continued to be built in Mamluk architectural style. A good example of this is the mosque and mausoleum of Mahmud Pasha built in 1567 which in many ways resembles the mosque of Sultan Hasan, with a large domed mausoleum behind the prayer hall. The minaret, however, is built in the classic Ottoman style with a tall thin fluted shaft. Probably the most famous building of Ottoman Cairo is the mosque of Muhammad Cali Pasha built between 1830 and 1848. This building has a classical Ottoman design consisting of a large central domed area flanked by semi-domes and a large open courtyard surrounded by arcades covered with shallow domes. On the west wall of the courtyard is a clock tower including a clock presented by Louis Philippe, King of France. The mosque was designed by an Armenian and is said to be based on the Sultan Ahmet Mosque in Istanbul. The continuous development of Cairo has meant that apart from the major monuments very few secular buildings have survived from before the Ottoman period. The earliest evidence for Cairo’s houses comes from excavations at Fustat where Iraqi-style four-iwan plan houses were discovered. This style consists of four iwans, one on each side of a central courtyard with a fountain. In each house the main iwan was divided into three, a central area and two side rooms. There are also descriptions of early Islamic Cairo which describe multi-storey apartments. During the Fatimid period we have the first evidence for the living unit known as the qaca which became the typical living unit of Cairo. This consists of a small courtyard area with two iwans opposite each other. The iwans could be closed off with folding doors whilst the courtyard could be covered over with an awning. On the upper floor overlooking the courtyard were wooden galleries. In Mamluk times the qaca was developed so that the central courtyard became smaller and was covered by a wooden dome or lantern. The central hall or courtyard would often be decorated with coloured marble and finely carved mashrabiyya doorways and screens. The central fountain was usually octagonal and was sometimes fed by a stream of water running from the back wall of the main iwan. In the late Mamluk and early Ottoman period a particular type of sitting room known as the maqad became popular. This consisted of an arcade on the upper floor level which overlooked the main public courtyard of an important residence. From the sixteenth century onwards important residences would also incorporate an extra kitchen for the preparation of coffee. In addition to private houses there were from a very early period blocks of houses or apartments which would have been rented by the occupiers. These buildings were known as ‘rabc’ and consisted of rows of two-storey apartments usually built above shops or khans. One of the earliest examples is the rabc of Sultan al-Ghuri at Khan al-Khalili. It is known that many of the larger houses had private bathrooms although these would not have included all the facilities available in a public bath house or hammam. Cairo is known to have had a large number of hammams although many of these have recently disappeared. In general the rooms of a bath house were fairly plain with the exception of the maslakh (reception hall) which was often domed and sometimes was supported with columns. D.Berhens-Abouseif, Islamic Architecture in Cairo: An Introduction, Supplements to Muquarnas vol. 3, Leiden 1989. This is the best modern summary of Islamic architecture in Cairo. K.A.C.Creswell, The Muslim Architecture of Egypt, Oxford 1952-60. Contains the most comprehensive discussion and treatment of buildings from the beginning of the Fatimid (969) to the end of the Mamluk (1517) periods. For domestic architecture see: J.C.Garcin, B.Maury, J.Revault and M.Zakariya, Palais et Maisons du Caire: I. D’Epoque Mamelouke (XIIIe-XVIe siecles), Paris 1982. B.Maury, A.Raymond, J.Revault and M.Zakariya, Palais et Maisons du Caire: II. Epoque Ottomane (XVIe- XVIIIe siecles) vol. 2, Paris 1983. For modern architecture see: M.al-Gawhury, Ex-Royal Palaces of Egypt, Cairo 1954. A.D.C.Hyland, A.G.Tipple and N.Wilkinson, Housing in Egypt, Newcastle-upon-Tyne 1984.